A brand new Cessna 525A CitationJet 2, D-IEVX, arrived at Milan-Linate following a flight from Köln. The Cessna was to carry out a return flight to Paris-Le Bourget, carrying two pilots, a Cessna sales manager and a prospective customer. The plane arrived at 06:59 and was taxied to the General aviation apron, also known as 'West apron'. It was a foggy morning at Milan and one of the passenger flights parked on the North apron was SAS MD-87 "Lage Viking" which was being prepared for flight SK686 to Copenhagen, scheduled to depart at 07:35. At 07:41, the pilot of the MD-87 contacted Linate Ground Control for his engine start clearance, as the boarding of 104 passengers had been completed. The Ground controller cleared the pilot to start engines and advised that the slot time for takeoff of the flight was at 08:16. Thirteen minutes later flight 686 was cleared to taxi to runway 36R: "Scandinavian 686 taxi to the holding position Cat III, QNH 1013 and please call me back entering the main taxiway." A few minutes later, the Cessna pilot requested permission to start the engines. The ground controller then gave start-up clearance. The ground controller then requested flight 686 to contact the Tower controller. From this moment on the crew of the MD-87 and the crew of the Cessna were tuned on two different radio frequencies. At 08:05 the pilots of the Cessna received taxi clearance: "Delta Victor Xray taxi north via Romeo 5, QNH 1013, call me back at the stop bar of the ... main runway extension." The pilot acknowledged by saying: "Roger via Romeo 5 and ... 1013, and call you back before reaching main runway." The Cessna started to taxi from the General Aviation parking position, following the yellow taxi line. After reaching the position where the yellow taxi line splits into two diverging directions, the pilot erroneously took the taxi line to right and entered taxiway R6. At 08:09 the Ground controller cleared the Cessna to continue its taxi on the North apron. At the same time the Tower controller cleared the MD-87 for takeoff: "...Scandinavian 686 Linate, clear for take off 36, the wind is calm report rolling, when airborne squawk ident." The pilot advanced the throttles and acknowledged the clearance: "Clear for takeoff 36 at when...airborne squawk ident and we are rolling, Scandinavian 686." When the MD-87 was speeding down the runway, the Cessna crossed the runway holding sign and entered the active runway 18L/36R. At 08.10:21 the nose landing gear of the MD-87 had left the ground and main gears were extending the shock absorbers but the main wheels were still on the ground at an airspeed of 146 knots (270,5 km/h). additional large nose-up elevator. At that moment the MD-87 collided with the CitationJet. The right wing of the MD-87 sustained damage at the leading edge and the right hand main landing gear leg broke off. It damaged the right flap and struck the no. 2 engine which then separated from the pylon. The pilot of the MD-87 gradually advanced the throttles and then the aircraft was airborne for a total of 12 seconds, reaching an estimated height of about 35 feet (11 meters). The left hand engine suffered a noticeable thrust reduction as a result of debris ingestion, which became insufficient to sustain flight. The airspeed had increased up to 166 knots (307,6 km/h), but the MD-87 descended abruptly making contact with the runway with the left hand maingear, the truncated right hand maingear leg and the tip of the right hand wing. Prior to touch down the pilot reduced engine thrust and after ground contact the engine reverse levers were activated and deployed (on the left hand engine only). Maximum available reverse thrust was selected and the brakes applied. The plane skidded past the grass overrun area, across a service road, crashing sideways into a baggage handling building, which partly collapsed. This building was located 20 m/67 feet to the right of the runway, and 460 m/1500 feet from the runway end. CAUSES: "After analysis of evidence available and information gathered, it can be assumed that the immediate cause for the accident has been the runway incursion in the active runway by the Cessna. The obvious consideration is that the human factor related action of the Cessna crew - during low visibility conditions - must be weighted against the scenario that allowed the course of events that led to the fatal collision; equally it can be stated that the system in place at Milano Linate airport was not geared to trap misunderstandings, let alone inadequate procedures, blatant human errors and faulty airport layout. - instructions, training and the prevailing environmental situation prevented the ATC personnel from having full control over the aircraft movements on ground. - the LVO implementation by ENAV (DOP 2/97) did not conform with the requirements provided in the corresponding and referenced ICAO DOC 4976. 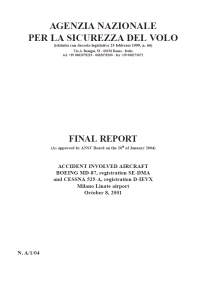 The combined effect of these factors, contemporaneously present on the 8th of October 2001 at Milano Linate, have neutralized any possible error corrective action and therefore allowed the accident." In April 2004 four officials accused of negligence and multiple manslaughter were sentenced to jail terms ranging from 6½ to 8 years. Judges gave eight-year prison sentences to the director of the Linate airport and the air traffic controller who was on duty at the time. The former CEO of Italy's air traffic control agency ENAV, and the person who oversees Milan's two airports, were sentenced to six years and six months apiece. Distance from Milano-Linate Airport to København-Kastrup Airport as the crow flies is 1148 km (717 miles).